Sometimes, in this crazy, mixed-up, meme-based post-digital society of ours, we get caught up in trivial concerns like a Space Jam sequel when the real crimes against nostalgia, like the underrepresentation of Billy Dee Williams on our nation’s TV and movie screens, go underreported. But while we still don’t have a definitive answer on whether Williams will ever return to the Star Wars movies as smooth-talking cardsharp turned smooth-talking Rebel leader Lando Calrissian, at least Pabst Brewing Company is doing something about the recent lack of Billy Dee on TV. 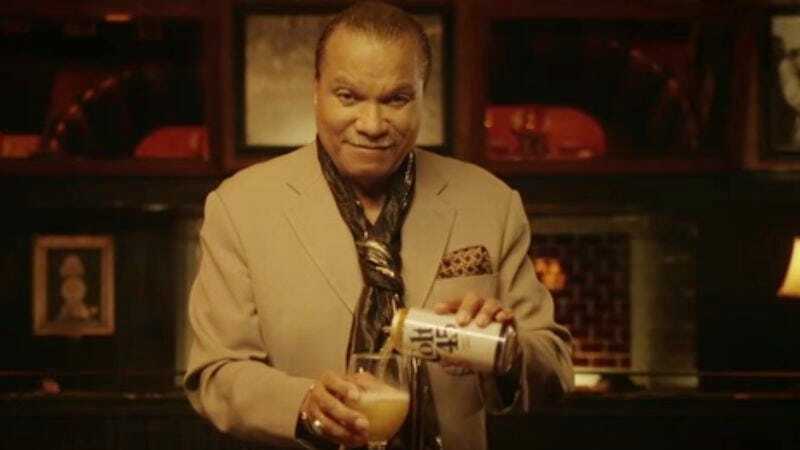 We don’t see any of that in Williams’ new Colt 45 ad, which stays away from outmoded ideas about seduction and consent and instead focuses on informing viewers that there’s a new Most Interesting Man in town, and his name is Billy Dee Williams. (Especially now that Snoop Dogg is out of the picture.) The Pabst marketing team still has the problem of Colt 45’s objectively pretty unpleasant taste to contend with, but these are the same people who convinced a generation that drinking PBR was a viable substitute for a personality, so they shouldn’t have too much trouble.